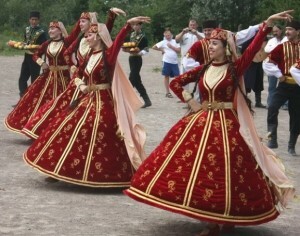 Crimean Tartar Dancers in a traditional dance. According to the latest census in 2001 the population of Crimea was 2,024,056 and the population of Sevastopol 377,153 which brings the total population of the Crimean Peninsula to 2,401,209. The estimated 2013 population for the peninsula is 1,967,119 inhabitants. The Crimean population has been consistently decreasing at a rate of 0.4% a year, mostly due to lower fertility rates in the Russian and Ukrainian populations. 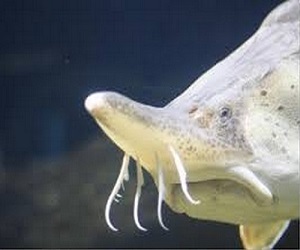 The ethnic Crimean tartar population has been growing at an annual rate of 0.9%. The same census shows that Russians comprised 58.32% of the population, Ukrainians 24.32%, Crimean Tartars 12.1%, Byelorussians 1.4%, Tartars 0.54%, Armenians 0.43%, Jews 0.22%, Greeks 0.15%. Few in number but still visible in their culture are Karaites and Kymchaks. About 77% of Crimeans claim Russian as their native language. 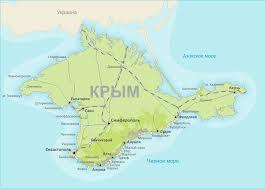 The ethnic history of Crimea is very complex and dramatic. The peninsula has been in the hands of many states and empires and its populations have been mixing for thousands of years. It is safe to say that the peninsula was a melting pot until 1944 when Stalin deported ethnic nationalities. About 200,000 Crimean Tartars, 70,000 Greeks, 14,000 Bulgarians, Germans, Bulgarians and Armenians were deported to Central Asia or Siberia. Roman historian Pliny the Elder noted that in the second century BC the mountains of Tauris, the name of Crimea in the Middle Ages, was peacefully inhabited by 30 nations. Mountains and islands often served as refuge for populations escaping wars. The reminders of those who captured and dominated the peninsula still survive. Today, Crimean Tartars are coming back to Crimea altering the ethnic composition of the peninsula. They are reviving their horticulturist and shepherd culture held for centuries before they were expelled by Stalin. For the past 30 years Koreans have been immigrating to the peninsula and are often seen in markets. They are great farmers and hardworking people, well respected by the local population.